Carausius, AD 286 to 293. AE antoninianus. Very nice specimen. Size : 23.5 x 25.0 mm. Weight : 5.17 grams. Reference : Sear - 3569. RIC V, 350. Grade : good XF (as struck) with a nice strike and glossy dark brown patina. A superb portrait of Carausius (more impressive in the hand that it appears on the image). 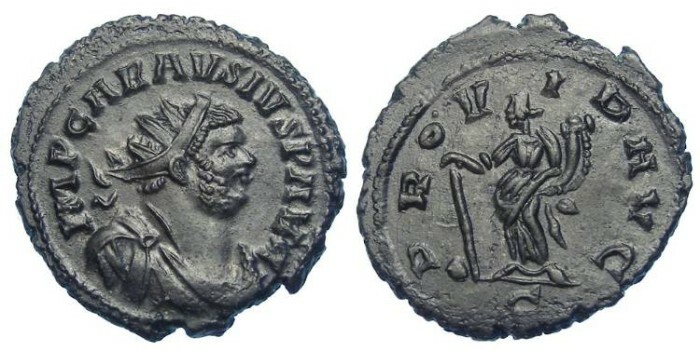 Obverse : Head of Carausius right, with IMP CARAVSIVS P F AVG around. Reverse : Providentia standing cornucopiae and pointing a baton at a globe at her feet, with PROVID AVG around, with the mint mark C below. The mint mark is the only significant weak point on this coin.